Vanilla extract lends a slightly sweet, but bold flavor to many desserts and baked goods. Because it contains alcohol, you might be wondering if it's safe to use while you're pregnant. If you eat foods that contain vanilla extract, you probably don't need to worry. Ingesting more than that might be harmful, so stick to vanilla-flavored foods and always ask your obstetrician about choosing the healthiest and most appropriate diet for you and your unborn baby. As a source of flavoring in food, vanilla extract is safe during pregnancy, according to Drugs.com. A serving of vanilla yogurt or a piece of homemade bread with vanilla extract in the recipe are examples of safe ways of using the flavoring in foods. 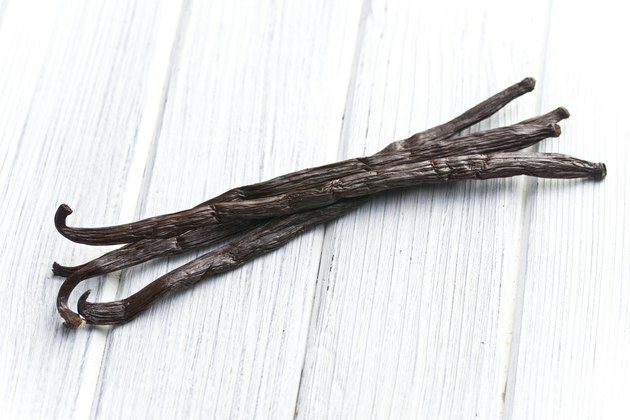 While there are no records of vanilla being toxic, according to Drugs.com, the lack of research regarding its use during pregnancy suggests that sticking to foods with vanilla over larger doses or supplements is the way to go while you're pregnant. Don't consume more vanilla than what you would eat as part of a recipe, Drugs.com cautions. There isn't enough scientific data to suggest whether higher doses of vanilla extract are safe, so it's better to err on the side of caution and stick to vanilla-flavored foods. The teaspoon or so that you would to add to muffins, bread or baked goods isn't likely to cause any adverse reactions. Vanilla extract contains approximately 35 percent alcohol. You probably wouldn't want to drink vanilla extract straight anyway because it isn't very tasty, but the cooking or baking process burns the alcohol off, which makes it safe. If you do choose to use vanilla in recipes while you're pregnant, make sure you're opting for true vanilla extracts. Skip versions from Mexico because they aren't always made with vanilla, the U.S. Food and Drug Administration reports. The Mexican fake vanilla extract is made with coumarin, which can be toxic and is banned in the United States. While the product looks, tastes and smells like vanilla, it can cause blood thinning, which is potentially dangerous during pregnancy. It can also interact with blood-thinning medications, the FDA notes. Many ethnic food stores and restaurants sell or use the fake vanilla, even though it's banned. If the vanilla you're considering is labeled with "Extracto de vainilla" or "Vainilla," skip it, the FDA warns. If you're worried about using vanilla extract, consider using whole vanilla beans instead. You can find whole vanilla beans in the spice section of your grocery store and can use them in many recipes. This eliminates the alcohol that's present in vanilla extract. If you're unsure of a certain brand or type of vanilla extract, always talk to your obstetrician before using it.